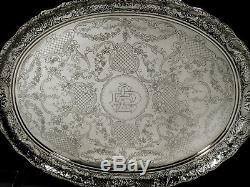 MARSHALL FIELDS STERLING TEA TRAY c1920 CHICAGO HAND DECORATED 173 OZ. 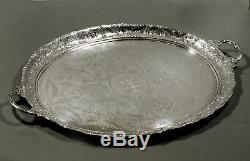 This is monumental c1920 Marshall Fields sterling silver tray for serving tea. The Chicago department store opened in 1867 and became Marshall Field & Co. At one time the second largest store in America. They opened their own silver work shop on the premises in the late 19th century. 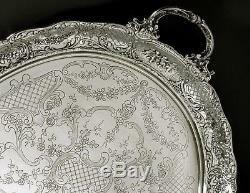 For a while most of the silver items were hand wrought. Often in the Arts & crafts manner. Classic circular with feathered lea scallop rim. Oval shield framing cherubs in dance, united by garden trellis. Medallion leaf and floral sprays and garland. 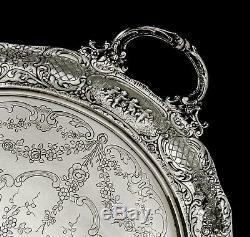 Recessed center with conforming hand engraved medallion, floral. Rolling vine and garden trellis medallion of various shape and size. Leaf crown feathered vine handles. 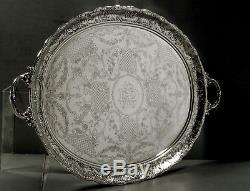 This fine and rare c1920 Marshall Fields Rococo Revival sterling tea serving. 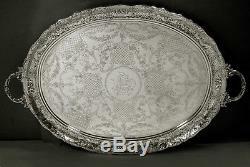 Tray is 30 inches across handles 19 1/2 across and weighs 173 standard ounces. 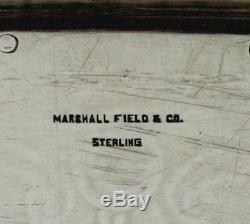 The item "Marshall Fields Sterling Tea Set Tray c1920 Chicago 173 OUNCES" is in sale since Sunday, August 19, 2018. This item is in the category "Antiques\Silver\Sterling Silver (.